Grooming your kitty serves several purposes. It removes dead hair and prevents their coat from matting. It also helps to cut down on hairballs and distributes oils that keep the skin healthy and their coat looking at its best. Some cats love to be groomed but others are not so keen. If your cat is one of the latter, a grooming glove could be the answer to your prayers. Anyone who knows how to stroke a cat can use a grooming glove! They are so easy to use. As you stroke your kitty, the loose hair gets stuck on the soft silicone or rubber nubs from which it can easily be peeled off. Grooming gloves are perfect for little kittens and for delicate areas such as the face. They come in many different varieties and there are different designs out there. To assist you in choosing what will suit you and your cat best, we have prepared a guide to choosing the best cat grooming glove. Our top pick is an all-in-one product that can be used for shedding, bathing and grooming. All five fingers can fit into the glove at the same time and there are scrubbing nodules on both the fingers and the palms. They fix onto your hands with a Velcro strap which stops them from falling off even when they are wet and covered in soap! The hair does not stick to the gloves, it can easily be removed. Your hands and finger-nails stay clean and free from odors. They are very flexible so you can grab hold of things when you are wearing them and you can massage your cat with comfort. They are available in five sizes. Made from fabric and rubber, these gloves are soft enough to be comfortable for both you and your pet. The nubs are made from 255 soft silicone for added comfort. They effectively remove loose hair, dander and dirt from your cat’s coat and distribute oils to keep the skin healthy. The mesh material stops your hands from getting hot and sweaty and dries quickly. One size fits all because the wrist strap is both adjustable and comfortable. The gloves work best if you wet them before you use them. It makes the hair easier to remove from the glove after use. You get one left and one right hand glove. A grooming mitten that’s made from totally recyclable material that is also easy to clean. It comes in one size and fits over your hand where you secure it with the Velcro strip on the adjustable strap. It feels soft against your pet’s skin so they are happy to be groomed by it! Excess and loose hair is trapped in the mitten, where it can be easily removed. You can use it on wet or dry coats. It can also be used to remove pet hair from the sofa and clothing. 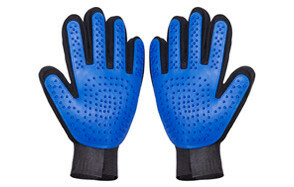 The material is comfortable and breathable to keep your hands feeling cool and comfortable. A comfortable pet grooming glove that is made from two layers of breathable 3D mesh polyester to keep your hands comfortable. The nubs are made from environmentally friendly 180 soft silicone. The material is completely safe for you and your cat and is durable. The gloves are very flexible to provide maximum comfort for your cat. You get a left and right glove in the pack and all you have to do is slip them on and secure them with a Velcro wrist strap. They work either wet or dry and when you have finished, you simply peel off the hair and throw it away. 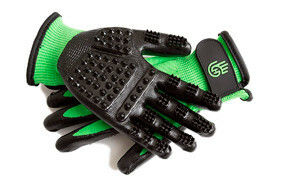 A pair of grooming gloves made from environmentally friendly materials. The five-finger design allows you to groom accurately around the face, legs and tail. The rubber tips are useful for massaging. The nubs on the palm area are rounded and therefore ideal for massaging. The nubs on the fingers are longer and thinner and they remove the dead hairs. You can use these gloves wet or dry and they fit on easily thanks to the adjustable Velcro strap. With these gloves, you get to choose from blue, red or hot pink as your color option! They are made from 3d mesh lightweight elastic spandex which is breathable and dries very quickly. They are available in one size but have a hidden elastic band so you can adjust them. They also have a tiger mouth opening at the wrist that makes them easy to get on and off. The tips/nubs are made from 180 soft silicone so they will not damage your cat’s delicate skin. Thanks to the three-row design, they are very efficient at removing hair. Made from BPA silicone and fabric, these are an environmentally product that is safe for you and your pet. Left and right gloves are included so you can use both hands and get the job done quicker. The soft nubs will not cause damage to your cat’s sensitive skin and are soft and relaxing. You can use them wet or dry and it is easy to pick the hairs off them when you are finished. For maximum comfort, they are breathable and fit securely thanks to the adjustable Velcro wrist straps. You can wash them after use and they dry very quickly. These grooming mittens are a lot more convenient and a lot more comfortable than a brush. This product is a good choice for traveling and can be folded up and popped in a bag. They have very soft rubber nubs on the palm and thumb that gently massage your cat’s coat. The fur gets trapped on the glove so you can dispose of it conveniently. The wrist band is adjustable and they are very quick to get on and off. You get one mitten so you can use the other hand to secure and reassure your cat. Getting at those tricky areas for grooming (the face, chest and behind the legs and tail) is not easy with a brush. With a grooming glove, it is a lot easier. You get one, five-fingered de-shedding glove in the pack which is designed to fit everyone. It has an adjustable Velcro wrist strap. It’s a massage tool and a hair collector all in one. You can even use it when it is wet. Once you are finished, it’s easy to pull off the hair and wash it ready for the next time. A pack of two grooming gloves that will imitate your hand touching your cat. They are made from soft materials that are perfectly safe for your cat. They are gentle enough to be used near your cat’s face. They can safely be used on cats with short or long coats. Your hands will stay cool and comfortable because the back of the gloves is made from a soft mesh that lets the sweat escape. There is an adjustable wrist strap to secure the glove on your hand. Grooming gloves are available in many different styles. The features that one cat owner values, may not be so important to another. Think about how you will use the grooming glove before you make a purchase. Here are some of the things that you may want to look out for in the best cat grooming gloves. How many of them are in a pack? This is an important consideration. Check the product description for how many gloves you get. Some are sold as single gloves and others are sold in pairs; one left and one right hand glove. You may prefer a pair of gloves so that you can use both hands at the same time to groom your cat and get the job done faster. Alternatively, perhaps you would prefer to have one hand free so that you can secure your cat or reach for other objects. This is very much a matter of personal preference. Again, this is a matter of personal preference. Some grooming gloves are just like traditional gloves and have five fingers. These take a little more effort to put on. However, because you can move your fingers into different positions, they are great for more intricate grooming in areas such as around the face. You can also grip things better if you need to. Other grooming gloves are, in fact, mittens with one space for all the fingers together and another for your thumb. They are very quick to get on and off but you lose dexterity so you can’t pick anything up and can only groom large areas. Many grooming gloves are made from environmentally friendly materials that can be recycled readily. Also, they need to be made of a material that is BPA free and perfectly safe for both you and your cat. It needs to be flexible so that it is comfortable for your cat. If your kitty finds it uncomfortable, they won’t let you use it on them! Ideally, they should feel just like they are being stroked by your hand. It is important that you are able to remove the hair easily from the cat hair glove when you have finished. Your comfort is also important. An ill-fitting glove is not comfortable. Some come in a range of sizes. Others come in one size and have an adjustable strap at the wrist which is usually secured by a Velcro strap. This is important because you don’t want them to come off when you are using them. Also, look out for the type of fabric that they are made from. A polyester mesh is a good option. You need a fabric that will let your skin breathe so you don’t get too hot and sweaty. You need to be able to clean the glove easily. Look out for products that are easy to wash and which will dry quickly so that you can use them again. You also need a glove that can be used wet or dry. Grooming gloves are multi-purpose. They are good for massaging your cat and for grooming. Most have one type of nub which is like a raised nodule that rubs against your cat’s skin and which helps to remove hairs. These nubs must be soft and rounded. Some gloves have a different type of nub on the fingers. These are longer and slightly more pointed and therefore are better at removing dead hairs. Grooming is not just for dogs! Cats benefit a lot from regular grooming as well. Firstly, there are the obvious benefits. These are things like reduction in shedding and keeping all the stray hair in one place! It’s a lot easier to pick hair off a glove than to collect it from all over your sofa and chairs. Regular grooming is vital for long-haired breeds because their coat can get very matted and that is uncomfortable and unhealthy for your cat. There are some added benefits that you may not have thought of. 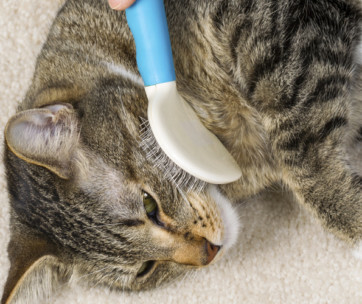 Grooming can help with reducing hairballs. These are balls of hair that accumulate in your cat’s stomach and which they often vomit up. This is unpleasant for the cat and even more so for the human that has to clear it up! Regular grooming with a grooming glove will remove loose hair so it cannot be swallowed by your cat when it grooms itself. Grooming gives you a chance to bond with your pet. They will probably prefer grooming gloves to a brush because it feels just like you are stroking them. The time that you spend together builds trust and helps to deepen the bond between you. It gives you a chance to have a little health check of your cat. You will be close enough to notice tick and flea infestations and you can start treatment quickly before the flea bites cause major irritation. You will also notice wounds which could become infected if they are not treated. Any lumps, bumps or skin problems that you find need to be investigated by your vet as soon as possible. Regular grooming increases the blood supply to the skin and this keeps it healthy. It also redistributes natural oils around the skin which acts as a natural moisturizer and protects the skin. You have the option of using a grooming glove or a cat brush for your kitty. Much of this comes down to personal choice but a grooming glove has a number of advantages. Here are some of them. Massage. Grooming is not just about removing dead hair. It can also act as a massage for the skin and this is best achieved with a grooming glove. The massaging action helps to increase blood circulation and distribute natural oils. This promotes a healthy skin and coat and can help with skin diseases and irritations. Relaxation. Many cats find it stressful to be groomed by a hard and inflexible cat brush. However, a grooming glove is just like the human hand and, to your kitty, it will feel just like being stroked and is more like the true touch of a human hand. Frequent grooming. 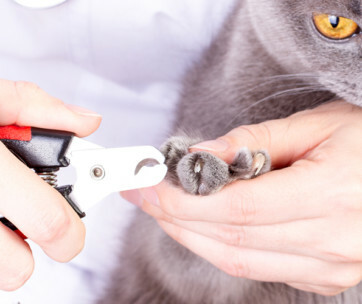 If your cat enjoys the feeling of being groomed, they will allow you to do it more often. This is more likely with a grooming glove. Dexterity. It is not easy or safe to groom delicate areas such as the face with a hard brush. However, with a soft, flexible grooming glove you can get at these hard-to-reach areas. Cleanliness. The grooming glove keeps your hands and fingernails completely clean because you are not touching your cat. Also, the gloves are very easy to clean when you have finished. You need to grip a brush tightly and your hand can get hot and sweaty. 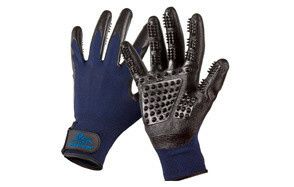 With a grooming glove, there is no strain on your wrist or hand and your hands stay cool and comfortable. Q: How to groom a cat using a glove? A: If you can get your kitty to love their pet glove, you will have a very useful grooming tool at your disposal for life. As with all things, your cat will have their own opinions about this! The secret to successful grooming with a grooming glove is to start with a ‘little and often’ approach. Gradually, build up the length of the sessions as your cat gets used to it. Start slowly with just one section of the body. It may take a while to work out which part of the body that should be! Keep the grooming gloves close to where your cat likes to sleep or where you usually make a fuss of them. Then you can ‘seize the moment’ when they are feeling relaxed. Start with very gentle and short strokes. It is important that the atmosphere is calm and relaxed so try not to get uptight. If your cat clearly doesn’t like it, just stop and try again another day. Try to make sure that there are no loud or sudden noises. You want your cat to associate grooming with a pleasant experience. It may help if you reward them afterward with a tasty treat. Q: At what age should I start grooming my cat? A: It is best to start grooming your kitty when they are as young as possible. Young kittens have not learned to groom themselves properly so they will benefit a lot from your help. This is where a grooming glove is really useful. Gloves are less terrifying for a little kitten than a big brush. Also, gloves are better on smaller areas and kittens have a lot of small areas! If you get your cat used to the grooming brush when they are young, they will grow up to be a lifelong fan. However, if you have an older cat and you have never tried a grooming glove, don’t despair. Many older cats get used to them with time. 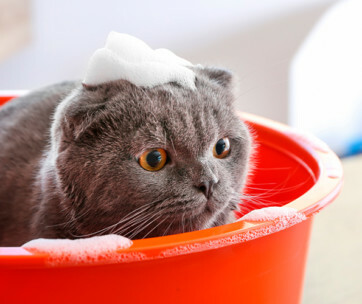 They can be very helpful for older cats who may struggle to keep their coat clean and could get matted. Q: Can I use a human hairbrush on my cat? A: This is not a good idea. Human brushes are designed for humans and cat brushes are designed for cats. They are generally too hard for a cat’s delicate coat and skin. Also, there are some skin conditions that you could pick up from your cat if you share a brush. One infection is ringworm which is caused by a virus. There are other bacterial infections that can be passed from a cat to a human. Therefore, cat grooming tools should be kept separately. Our top pick of the best cat grooming gloves can be used to reduce shedding and matting and for relaxing massages. You get two gloves in a pack so the job gets done quicker. The nodules/nubs are on the fingers and palm and are soft. They are available in five sizes so you can have a perfect fit and fix securely with a Velcro strap. Stray hairs are easy to remove from the gloves whilst your hands stay perfectly clean.